Yogesh Gokhale for reviewing prior to publication. The existence of sacred groves in India most likely dates back to an ancient pre-agrarian hunter-gathering era, and their presence has been documented since the early 1800s. Believing trees to be the abode of gods and ancestral spirits, many communities set aside sanctified areas of forest and established rules and customs to ensure their protection. These rules varied from grove to grove but often prohibited the felling of trees, the collection of any material from the forest floor, and the killing of animals. Presiding deities administered punishment, often death, to individuals who violated the rules, and sometimes to the entire community in the form of disease or crop failure. As a result of these protective restrictions, preserved over countless years, sacred groves are now important reservoirs of biodiversity. 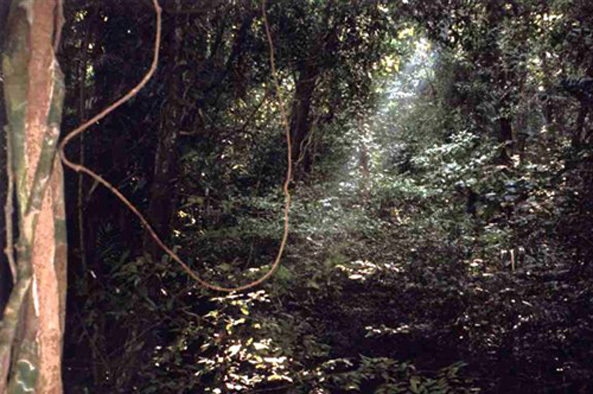 Sacred groves are often the last refuge for endemic and endangered plant and animal species. They are storehouses of medicinal plants valuable to village communities as well as modern pharmacopoeia, and they contain wild relatives of crop species that can help to improve cultivated varieties. Sacred groves also provide for the water needs of nearby communities. Many sacred groves contain water resources such as ponds and streams, and the vegetative mass that covers the floor of a grove can absorb water during rainy seasons and release it during times of drought. Trees also improve soil stability, prevent topsoil erosion and provide irrigation for agriculture in drier climates. There is vast diversity among India’s sacred groves. Some contain only a few trees, while others are hundreds of acres in size. Sometimes groves overlap with larger forested areas, while others exist as islands in open plains or desert. Even their names vary from region to region. Most sacred groves in India are associated with the almost 40,000 endogamous groups within the Hindu caste system and other major religions such as Buddhism and Islam, along with other religious communities and traditional tribal groups. In many groves, villagers perform annual rituals and ceremonies to appease the presiding deity and ensure the well-being of the community. It is also common for people to make individual offerings, often in the form of terracotta figures, in exchange for wishes such as good health or harvest or the birth of a child. Sacred groves help to define the cultural identity of the communities that revere and protect them. They are also closely linked to the politics and economies of their communities, and their legal status and management vary among regions and individual villages. Some groves are associated with and managed by separate caste groups within a community, some by a village as a whole, and some by neighboring districts within a larger geographical area. There are also large “pan-Indian” groves that involve people from many parts of the country. In some groves, all forms of resource extraction are strictly prohibited, while in others people may collect material such as fallen branches and leaves from the forest floor or fruit from the trees. The Western Ghats — a mountain range that runs along India’s west coast, through the states of Maharastra, Goa, Karnataka, Tamil Nadu and Kerala — is one of the world’s biodiversity “hotspots.” Its ecosystems include tropical wet forest, mountain evergreens, moist deciduous forest and scrub grassland. An estimated 2,000 plant species and 300 vertebrate animal species live in this region and nowhere else. Karnataka harbors nearly 1,500 documented sacred groves, which are most commonly called devarakadus or devarkans. In smaller groves, tree cutting or other resource extraction is strictly prohibited, while larger groves often function as “resource forests,” in which people are allowed to gather products for sustenance. In Kerala, sacred groves are called kavusand at least 2,000 have been documented. Hundreds are dedicated to snakes, which protect agricultural crops by controlling insect and rodent populations. The Bishnoi tribes manage sacred groves called orans in the arid and desert regions of Rajasthan, in northwest India. Despite sparse vegetation and limited water resources, the area reportedly supports a higher density of human and animal populations than any other desert region in the world because of the conservation practices of its people. The basic philosophy of the Bishnoi faith is that all living things have a right to live and share resources, and the group has a set of abiding laws including a ban on killing animals and on felling trees, especially their most sacred khejadi tree, which has numerous life-sustaining properties. Its dropped leaves can be used for fodder, its dropped branches for fuel and its fruit for food. Khejadi trees stabilize sand dunes and they are said to increase yields of crops that grow close by. The orans also provide a protective habitat for the Indian gazelle and blackbuck. There are only a handful of documented sacred groves in Rajasthan, but their areas often exceed thousands of acres. The rapid march of modernization over the past century has depleted India’s sacred groves and altered the traditional social systems that have protected them. The threats to sacred groves differ as much as the regions and groves themselves. Sacred groves in many parts of the country have been destroyed over the past century to make way for development projects such as railroads, highways and dams. In many places the government has ignored local communities’ customary management rights and allowed the development of commercial forestry operations or encroachment by people migrating from outside the community who do not respect traditional practice. Some “pan-Indian” groves are burdened by large numbers of tourists and pilgrims. Many groves are suffering what is called “Sanskritization,” the transformation of primitive nature worship into formal Hindu practice. This has led to the clearing of areas in groves to make way for temples and a shift in focus to idols rather than nature itself. Of greatest concern is the loss of traditional wisdom and practices brought about by the increasing presence of westernized urban culture and an ever-expanding market economy. These forces have led many communities to lose their unified identity, a key element of their conservation practice, and to destroy resources in their sacred groves in return for short-term commercial gain. In the modern educational system, younger generations are not learning respect for local traditions and belief in the cultural importance of sacred groves. Many now view the practices of the past as superstition. Fortunately, many conservationists and communities, along with government and nongovernmental organizations in India have realized that development, progress and modernity do not mean turning one’s back on tradition, but rather that traditional wisdom can and must be integrated into modern systems. The cause of protecting India’s sacred groves has been gaining attention, and regional preservation efforts abound. New sacred grove management plans aim to restore power to local communities. Sacred grove awareness campaigns in communities and schools propose to educate people about the value of biodiversity conservation and to stimulate the revival of traditions. In 1999 the Indira Gandhi Rashtriya Manav Sanghralaya (the National Museum of Mankind) and several other institutions established a museum for sacred groves with the goal of raising awareness of the important role these ancient forests play in conservation. Located on a 200-acre campus in Bhopal, the outdoor museum replicates plots of sacred groves from different parts of India, including the orans of Rajasthan and the devarakadus of Karnakata. The museum also celebrates the communities, festivals and rituals associated with each grove. Additionally, the museum has organized a traveling exhibition to build greater ties with local communities and organizations throughout the country, as well as a Sacred Grove Festival. The Society for Ecological Restoration-India has undertaken a sacred grove restoration project in Goa, utilizing volunteers organized by Earthwatch Institute. The project aims to restore a degraded grove; create a native plant nursery; inventory the plants, animals and soil at a “relatively intact” grove; document traditional management practices; and educate local communities about grove restoration techniques. Many local or regional projects are documenting and cataloging the biodiversity of sacred groves, both to aid in conservation strategy and to assert community rights to prevent outsiders, namely pharmaceutical companies, from patenting local species and traditional knowledge. The NCL Center for Biodiversity Informatics is developing a Web-interfaced multimedia database to document the biodiversity status of sacred groves; it will also include such information as culture and traditions, conservation history, taboos and stories associated with them. According to Indian researcher Yogesh Gokhale, there are a large number of distinct local art forms associated with the deities of sacred groves, and they are an important cultural aspect closely associated with sacred traditions. In Karnataka and Kerala states alone there are more than 1,000 different deities of sacred groves. However, hardly any documentation is available on the local art forms associated with these deities, namely ritualistic dances and dramatizations that are called Theyyam in Kerala and Nagmandalam, among other names, in Karnataka. “There is a strong need to document these practices to develop the picture of the social history of the area as the performers often tell you a long story of how the deity was created,” Gokhale said. Bhattacharya, Anupama. “Tribal Faiths — Bishnois: Fierce custodians of nature.” Life Positive, December 1998. Center for Science and the Environment. “Sacred Groves: Last Refuge.” Down to Earth Extra, December 31, 2003. Pandey, Deep Narayan. “Traditional Knowledge Systems for Biodiversity Conservation.” Infinity Foundation. Swamy, P.S., M. Kumar and S.M. Sundarapandian. 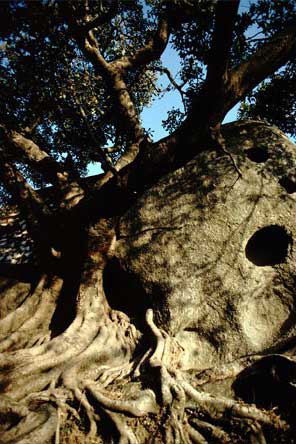 “Spirituality and Ecology of Sacred Groves in Tamil Nadu, India.” Unaslyva 213, Vol. 54, 2003.